A proper warm-up is an important part of any type of exercise routine. Warming up loosens and warms your muscles, decreasing your risk of injury. The fast pace of sprinting calls for quick action from your muscles. The rapid race times can cause muscle and ligament strains if you are not properly warmed up. A proper warm-up for sprinters includes stretches and drills to get your muscles moving and to refine your form on the track. 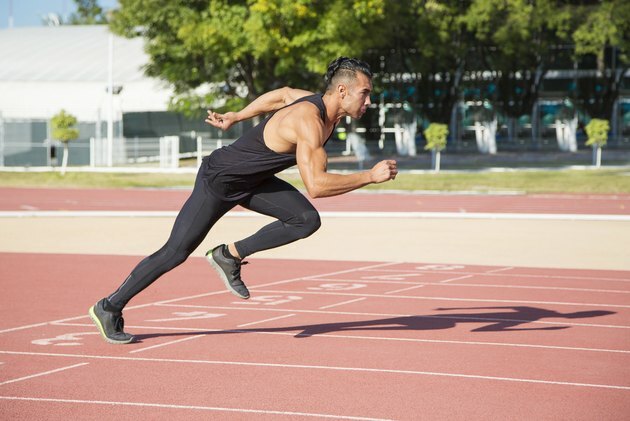 Jog for at least 20 minutes or two laps around the track before you begin sprinting. A slow jog elevates your heart rate and raises your body temperature, preparing you for the arduous sprint training that follows. You should be perspiring slightly but not drenched with sweat at the end of your jog. Loosen your hamstrings and calf muscles with a modified hurdler's stretch. Sit on the ground with your left leg straight out in front of you. Bend your right knee so the sole of your right foot is pressed against your left thigh. Keeping your back straight, bend at the waist and try to touch the toes of your left foot. Hold the position for 15 to 30 seconds. Complete two to four repetitions with each leg. Stretch your foot muscles and ankles with heel-toe drills. Take a step forward, landing on the heel of your front foot. At the same time, raise yourself up on the toes of your back foot. Use a rolling motion to transfer your weight from heel to toe for each step. Perform the heel-toe drill for about 20 meters or 65 feet, approximately one-fifth of the straightaway on a 400-meter track. Extend the range of motion in your hips with "A" marches. Walk with exaggerated steps, bringing your knees up high toward your waist. Bring your arms up with elbows bent and your fingertips pointing toward the sky each time you raise your knee. You can also quicken your pace with an A skip. Complete 20 meters of either A marches or skips. This drill also helps maintain and refine the proper position of a sprinter. Do front and lateral lunges as part of a sprinting warm-up. Take a step with one leg in front of the other. Both knees should be bent, but do not let the back knee touch the ground. Balance in the lunge position for three seconds before switching legs. Take side steps with both knees bent and back straight to complete lateral lunges. The lateral movements improve balance when sprinting around curves, such as in a 200-meter race. Practice accelerations as the last part of a sprinter's warm-up. Sprint all out for 10 meters and stop. Sprint for 20 meters next and then run at top speed for 30, 40 and 50 meters. After your accelerations, you are properly warmed up and can work on your technique for relays, hurdles or other sprint events.